Stacy Shoemaker Rauen is a well-respected and talented editor and writer, and is the editor in chief for Hospitality Design (HD) magazine, the leading publication for the industry. Besides overseeing the content and direction of the magazine, Rauen is a noted speaker at industry events, and as an avid tracker of trends, places, projects, and people, she puts together panels at HD's conferences, and has been quoted in various respected media outlets including CNBC and the Washington Post. She is also the founder of HD's CitySCENE, a networking event series held in metropolitan areas throughout the U.S. and internationally, meant to connect design professionals in each market, as well as NextGen Forum, a conference for the next generation of hospitality design leaders. She holds two degrees from Northwestern University's Medill School of Journalism, including a master's in journalism. I somewhat fell backwards into it. I graduated with my master’s in magazine journalism from Northwestern University (my undergraduate degree was also in journalism from NU) and moved home to New Jersey to look for a job in New York, and then the terrible tragedy of 9/11 happened. It wasn’t the best time to be looking for a job, to say the least, so I started temping—first at Vogue, and then at Traditional Home magazine, working in the marketing department on their showhouse design tours. Wanting to get back to the editorial side, I started interviewing at various places. One of them was for a former sister magazine to Hospitality Design (HD). But it was a weekly covering the meeting industry, and I knew I wasn’t cut out for a weekly. HR kept my resume on file and when the job opened up at HD, Michael Adams, our editorial director and former editor in chief, pulled my resume out of the pile as he is a Northwestern alum as well, and hired me as an associate editor. That was 13 years ago. Tell us about Hospitality Design magazine. What is your vision for the magazine? Simply put, HD is the No. 1 trade magazine for the hospitality design industry. We cover the newest and greatest design-focused hotels, restaurants, nightspots, spas, and other hospitality spaces, and the people behind them—the designers, architects, owners, purchasers, and brand executives. We also showcase the latest products and their designers and manufacturers, track trends, highlight innovative sustainable projects, and delve into development hotspots. We are pretty, but also have depth. I see us as a champion of the hospitality design industry—to celebrate the incredible people and innovation that make up our industry. We push ourselves to constantly find new people, places, and things worthy of coverage. And it’s a great time for design in this industry. It’s rare—and I feel lucky—to be in a position where I am inspired each day. What strategic partnerships/marketing strategies have you implemented that have attributed to Hospitality Design Magazine's success? When I was hired, I was told to find and meet new designers. And that’s exactly what I did. And as I did that I realized what, for a lack of better word, an incestuous industry this is—everyone knows everyone, they have worked together, are really good friends, etc. And so I thought in an industry where everyone is so busy, wouldn’t it be nice to bring everyone together to have a cocktail and catch up, and to meet new people. And so CitySCENE: Next Generation Networking was born. For our first event in New York, 65 people were invited and 65 people showed up (now our New York event brings together some 400 people). It was originally intended to give the younger members of the industry an outlet, but in the last decade it has morphed into regional networking events. Before each one we host an informal roundtable discussion with the night’s sponsors and a few of the attendees to discuss what they are working on, challenges they are facing, and their pulse on the industry in general. It has become a great way for us to not only get updates on the major players, but also for those participating to hear from—and commiserate with—their peers. Where do I begin? Experiential, authentic, and locally inspired designs are what everyone is hoping to achieve. We have been watching—and covering—the influx of new lifestyle brands from both veteran and upstart companies, which are all trying to attract that all-powerful Millennial customer (the M word, as I call it). In the end, I think it’s more about designing for a mindset rather than an age, with interactive, varied public spaces that invite people to hang out, and thoughtful experiences that are immersed in the location. At the same time, there is a new focus on wellness hotels—from IHG’s Even brand to the much-anticipated opening of Barry Sternlicht’s 1 Hotels and the recently announced Equinox Hotels. For us, capitalizing on them is making sure we know and have the relationships with the important players to secure the exclusives for the magazine, and to get them to speak at our annual tradeshow and conference HD Expo, where we like to bring the pages of the magazine to life. Work motto: KISS—keep it simple stupid. The clearer, the simpler the message the better and more effective. In terms of life, I am a glass half full type of gal, and a few years ago I decided not to surround myself with the glass is half empty people. Life is too short—live life to its fullest each and every day, work hard and play harder, tell those who you love that you do each day, and do what you love. For those who know me, for better or for worse, I live and breathe this industry, so luckily many days my job doesn’t feel like one. The best thing about my job: it isn’t a typical editor position. Besides working on our 10 issues, we also host and plan multiple events throughout the year—HD Summit, our invite-only thinktank for top-tier design executives with Ted-like speakers; HD Expo, our annual tradeshow and conference in Las Vegas in May which boasts some 800 exhibitors and 30 conference sessions; CitySCENE, regional networking events in eight cities a year; HD Awards, a celebration in New York where we honor the winners and finalists of our annual competition; Platinum Circle Gala, a black tie affair where we pay tribute to a handful of industry leaders for their career achievements; and NextGen Forum, a hybrid conference for the next generation of industry leaders. With all of these events, plus the magazine and our website, we aim to be—and our motto is—the ultimate connector to the hospitality industry. We strive to foster a community by offering a way for everyone to be more informed, inspired, and linked in. And to do this successfully, we make sure we bring together all of the industry players—designers, architects, purchasers, brands, restaurant groups, ownership/development companies, and manufacturers. 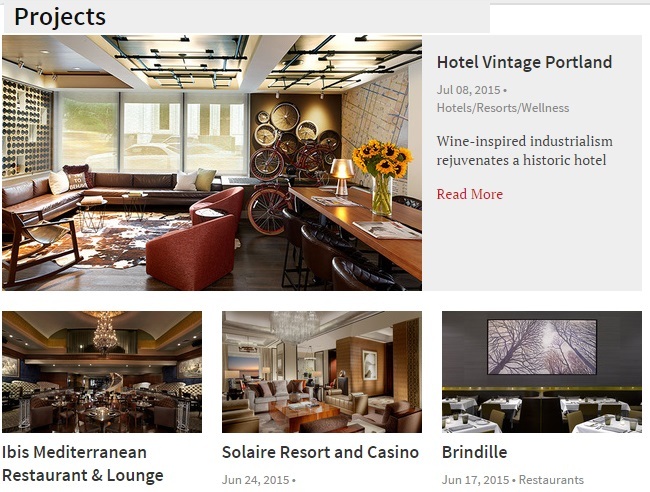 Your greatest success as EIC of Hospitality Design Magazine? Most difficult moment-how did you overcome and what did you learn? I have only been editor in chief for over a year now (I took the reigns in March of 2014) but I think my most recent success is the launch of our invite-only NextGen Forum. We saw the need for an intimate conference that speaks to that next generation of leaders—rock stars of the various design, purchasing, architecture firms, and brands or ownership groups (those who are heavily involved in the projects and making design decisions), and those entrepreneurs who have recently gone out on their own. Besides taking a few months to identify the attendees, I curated a day and a half of programming that’s a mix of Ted-like speakers and our more traditional conference programming, with a cocktail reception and dinner at some of Chicago’s newest design spots. We just held our third NextGen event in June and overall it has been really well received—we had 120 attendees and sold out in terms of sponsorships—and we are excited to see where we can take it. Launching this event was my most difficult moment. Not only did our sales team have to get buy in on the sponsor side, but we also needed the leaders of the various firms and companies to believe in us and the program enough to send their team members to the event. It was a build it, hopefully they will come moment. And once they came, we still needed the speakers deliver. Luckily they have on both ends. I learned that sometimes you have to jump in with both feet and trust that your gut feeling or judgment is right. If you don’t take the risk, you won’t find the reward. Your advice to an aspiring Editor/Journalist? I am a J-school believer, so besides getting a strong education in the fundamentals, I have three pieces of advice. First, write about something you are passionate about—you will be happier and your writing will be stronger. Second, to be a good writer you have to be a better editor. Learning to edit yourself is one of the hardest things to do, and it comes with practice, and sometimes putting down a story to come back to it with fresh eyes. And lastly, write as much as you can—letters, notes, in a journal. The more you write, no matter what it is about, the better you become. Describe the ideal experience reading Hospitality Design magazine. Well, obviously everyone reads the magazine cover to cover. I love when readers tell me they ripped out a section or a photo or a page from our magazine for research or a for a project they are working on. Or when I visit a designer’s office and our magazines are stacked in the library. Then I know we are doing something right. I try to motivate by not micro managing. I let them take ownership of their projects and step in or offer help as needed to guide them in the right direction. I also try to create a collaborative work environment, where everyone’s views and thoughts are heard. And I reward hard work. We are a small, tight-knit group so making sure everyone is happy is important. A bowl of Cacio y Pepe and a glass of Pinot Grigio. Yes, I’m a simple girl at heart. Second would be a really great gnocchi marinara. My mom is half Italian and her Sicilian father used to put marinara sauce on everything. I could as well. Currently, Vanity Fair, and my Kindle loaded with a few books including Lean In. It’s waiting patiently for me to find some downtime. In business, there are few women I admire, not only for their success, but also because they are market disruptors, are well respected, and give back—Niki Leondakis, Commune Hotels + Resorts, and fashion designer Tory Burch, to name a few. Personally, I would have to say my mom, Cherie Shoemaker. She loves you unconditionally but tells you like she sees it, is always in your corner, is the fiercest multi-tasker I know, and a damn good real estate agent who has always chosen clients she enjoys spending time with versus those with the deepest pockets. Obviously you know your perspectives are going to change when you become a parent, but I didn’t realize how much I would better appreciate—and need—her over the last few years. And I couldn’t have a fulltime career and be a mom without her support. My family. I have a son who is 2 years and 8 months old, and identical twin boys who are almost 8 months old. They keep me busy to say the least. And out of being pregnant came the idea of Bump Water, a prenatal vitamin-enhanced flavored water for women, especially moms and moms to be, which I launched with my husband and friends last year. It’s been exciting to learn an entirely different industry. That’s a tough one. I am happiest with a beach and a view. The ones I still dream about are in Maui, Laguna Beach, and the Amalfi Coast. What's next for Hospitality Design magazine? A lot! Of note, we recently announced this year’s Platinum Circle honorees: Gary Dollens, Hyatt Hotels; Kemper Hyers, Starwood Capital; chef Nobu Matsuhisa; and we are giving design firm HBA our Visionary Award for 50 years of innovation. And we are working on a concept that would bring HD to Art Basel this year.